It’s hard to believe that this blog has already been around for a year! It makes one wonder … Where does the time go? Time management for actors can be one of our biggest challenges. So this month’s article is dedicated to this very subject. And perhaps you can find out where do your “Actor Hours” go? A lot of actors think (and truly believe) that they spend a lot of time working on their careers, but when it comes down to it, many usually spend a lot of time THINKING and WORRYING about their acting careers…. Not actually PURSUING their careers. If you want to be a working and successful actor, it is up to YOU. Nobody else. Not your agent, or manager, or friends in high places, or significant other, or parents, or anyone else… Just you! So for many, it may be time to get into action! 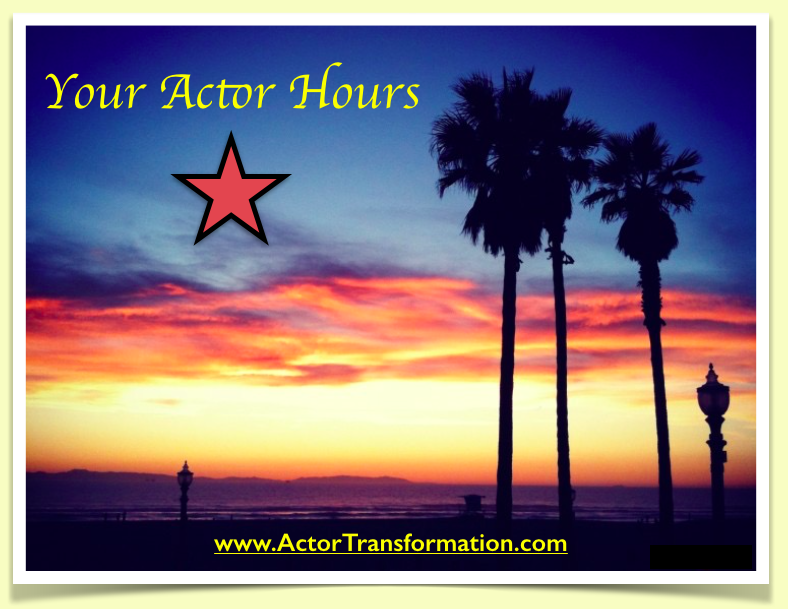 For others, it may be time to redistribute your “actor hours”. I have seen many actors talk about how they are going to do this or that for their careers, and 6 months later, they are still saying the same things. The truth is, if you live in Los Angeles or New York, an actor can get great headshots in their hands within 48 hours if they really want to. A demo reel within a few days. There are great companies that you can pay to shoot and edit a demo reel for you! There are many ways to get free publicity. There are many ways to get new representation. There are many ways to book more work. But the problem becomes when actors wallow in the challenges instead of living in the actions. There are 168 hours in the week. Even if you are working at a 40 hour a week survival job, take stock in where exactly the other 128 hours are going. Of course you have to eat, sleep, play, work, live etc… but it is important to use your “Actor Time” wisely. And please be honest with yourself… Are you doing everything you can to further your acting career? If the answer is no, get with a career coach. They can give you great actions and help you with your goals to propel your career to the next level. Many actors believe that if they do a couple actions a week for their careers, then they are really in “The Game”. I know this may not be fun to hear but just submitting online and taking an acting class or two and getting an agent does not a career make! They are pieces of the puzzle, but they do not complete the whole picture. A true career as a working actor takes consistent daily targeted action. * Write down everything that you have done for your acting career today. Then the last 30 days. If you find that your career has not grown on a massive scale, from where it was a year ago, I would suggest you that you look at where you are spending a typical day. Even if you work full time and have kids and are doing tons of other things on any given day, you need to allow time for your career. For the big dream. Because life is way too short. And you don’t want to get to the end of your life as say that you didn’t really go after your dreams. If you REALLY want to star in your own series, or make millions in commercials, or win an Oscar someday, you need to do the things that would cause those to happen. You need to take steps towards those goals today! Right now! Limit your TV watching. Time yourself when you are on the computer so you don’t end up wasting hours on the computer black hole. Plan small daily achievable goals and actually DO them. Even if you only have an hour per day for your career… use your time wisely and make the most out of that hour. One proactive targeted hour will accomplish much more than four hours of thinking really hard about WANTING to be an actor. Simply put… Stop Thinking! Start Doing! So when you look back on your day, your year, even your life, … You will know that you truly went after the gold!